One of the benefits of moving from Tel Aviv to New York is Sunday. While in Israel, Sunday is the first day of the work week, in New York, Sunday gives me a weekly dose of vacation. Restaurants are open. Public transportation runs. The city literally beckons to you to come out and enjoy it! While the Sundays of my early 20s used to be devoted to getting a head start on work, now my Sundays are all about exploring the city with Ben and our Little One. This time, when we arrived to board the ferry a little before 12:30 PM, we had no trouble getting on. The cost was $2 per person, minus Little One, who rode for free, and the ride took about eight minutes. The views of Lower Manhattan and the Statue of Liberty were extraordinary. If you’re looking for a mini New York getaway with your Little One, Governor’s Island is the place to go. Here’s what we absolutely loved. First things first. While Little One had a peanut butter sandwich to chow down on, Ben and I arrived famished. At Liggett Square, which is a 10-minute walk or so from the ferry’s drop-off spot, there are loads of food booths. We went for the Jamaican booth and ate cod cakes, plantains, rice and beans, collard greens, and seitan. The food was greasy, filling, and delicious. I used to be an avid biker— not necessarily a good one, but a committed one. I biked every morning in Riverside Park during my junior year of college, and I got around by biking on sidewalks like a maniac in Tel Aviv. Governor’s Island was the perfect place to share my love of biking with Little One. There were no crazy New York bikers there, just New Yorkers who had apparently transformed into relaxed, polite, and friendly bikers. We rented bikes from Blazing Saddles, the only bike shop on the island. They offered four-seater surreys, which feature a place up front for your Little One, as well as adult bikes with a kid’s trailer. But I wanted to go traditional and chose a bike with a regular child’s bike seat in the back. Renting our two very sturdy bikes for two hours cost us $50 altogether. During that time, we rode around the stunning perimeter of the island at a comfortable pace, taking in the exquisite views. Little One promptly fell asleep and we coasted along the smooth pavement, while I sang “Hakuna Matata” (I’m not even kidding) and occasionally asked Ben to check on Little One and reapply his sunscreen. 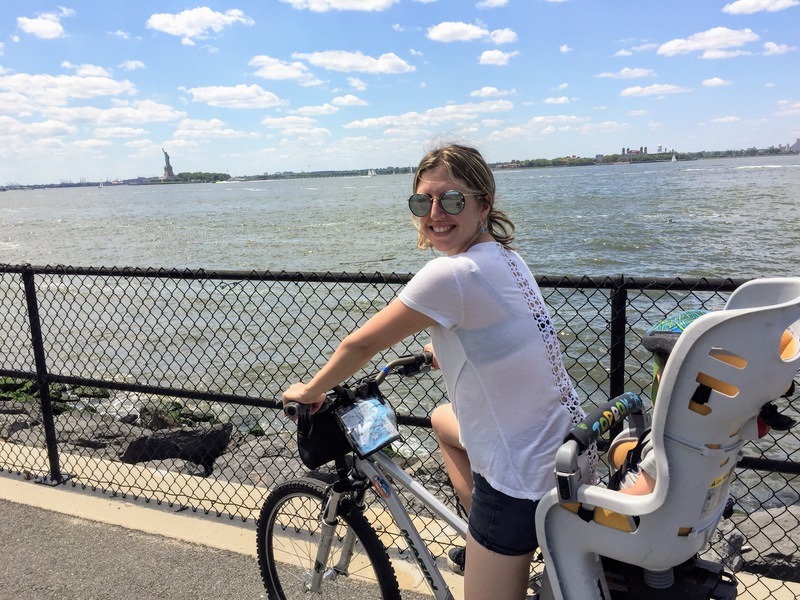 As I’m now well aware, there’s no such thing as stress-free travel when traveling with a toddler, but I still feel like I came pretty close while biking on Governor’s Island. The staff cheered us on as we returned to the Blazing Saddles tent, and Little One, who had just awoken from his nap, clapped enthusiastically. I can’t wait to bike with him again. After breaking a sweat while biking, we headed to the play fountains. With a comfortable barrier that ensured that Little One wouldn’t toddle off, I watched our son play in the water, filling up a bottle and dipping in his toes. Ben, in the meantime, took one for the team and waited in line at a Mister Softee truck for ice cream. When traveling with a toddler, we’ve learned that it’s best not to over plan and over exert ourselves. The key is to choose one or two activities that you really want to do — and that will be fun for your Little One, too — and then to throw in another easy activity if possible. There were tons of other things we could’ve done on Governor’s Island, including two that Little One might’ve loved. One was lying on a hammock, but all of the hammocks were taken. And another was playing in the junkyard playground — which he may have been a little young for, but I still think he would’ve enjoyed it. If you’re planning to visit Governor’s Island, I recommend packing snacks and drinks for your Little One, as well as lots of sunscreen and an umbrella stroller. Though regular-sized strollers fit on the ferry, we were much more comfortable squeezing through the aisles with our amazing Wonder Buggy. Also, thanks to its low price, we weren’t worried about storing it when we went biking. And by storing it, I mean, putting it on the side with all of the other strollers, with no one guarding it. Maybe I’m a total New Yorker, but I was shocked when the staff person told me that no one’s stroller had been stolen this season. And I was thrilled that our stroller was not the first casualty of the summer. Governor’s Island truly provided an escape from Manhattan — from the hustle and bustle, the crowds, and the constant feeling that you need to walk fast, even though you’re not sure why. We slowed down, and we enjoyed life and each other. What are your favorite things to do on Governor’s Island? I’m looking forward to trying it out! We too attempted once but the line was crazy and we went home. Maybe we’ll get lucky next time. Thanks for the tips!